In this series we are examining how to measure and analyze the revenue stream, if you didn’t catch the first part I encourage you to start there first. In this section we are going to convert our revenue of our fictitious company into percentages and show you a few things to look for and once again a few pitfalls to avoid. We will also compare both the straight revenue charts and the percentage charts to show some significant differences. Click here to get our Sample Template Now! A few quick pointers for those experience in Excel and don’t need to see our guide on setting up the sheet. Always total percentages. I have had many times where something goes amiss and it wreaks havoc with the equations afterwards. When doing the percentages against the current year, make sure you use the annual projection, not the year to date (YTD) revenue. Just like when looking at revenue the first thing I look for is the basic trend pattern; it will follow the same basic pattern as the revenue dollars trend. If it looks significantly different you might need to go back and check your equations. The next thing you should notice is the lines overlap and intertwine more; this is the nature of percentages, since it turns everything into more of an apples to apples comparison. 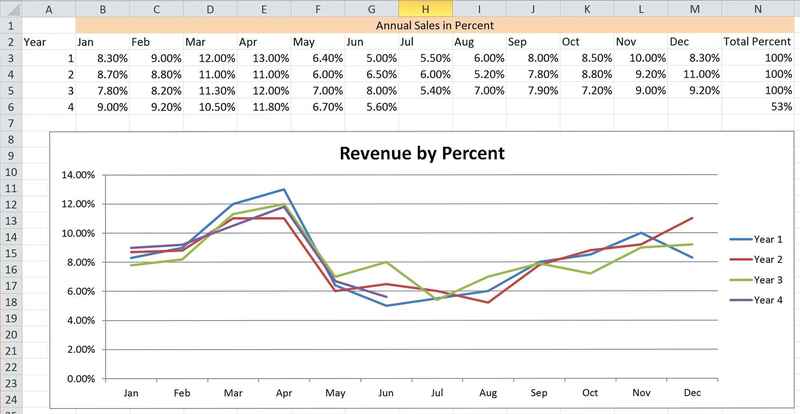 Generally, this chart will show you many of the same things as the revenue chart, the general pattern of the customer and the seasonality of the business. The biggest difference is that it now shows you how each period worked against the prior year. To explain this a little better, I’m going to put the charts on top of each other. If we look at revenue by dollars only, Year 4 is clearly the best year—actually Jan–May it is clearly the revenue leader—but when looking at the percentages you clearly see the performance is not as strong as it could have been. Of course this can be cause for any number of reasons, some internal, some external. The IRS might be delaying refunds (2015), which of course is pretty hard to work around or it can be as simple as Joe the salesman got the flu and was off his game. This you can do something about—no you cannot mandate employees get a flu shot, but you can sure incentivize for them to get a flu shot. We’ll show you how to do the math for the loss in coming posts. This is all about spotting trends and correlating it to a real world event. Take a look how one year ends and the next begins. Year 1 ends weak, Year 2 starts relatively strong, Year 2 ends strong, Year 3 starts weak, Year 3 ends average, and Year 4 starts strong. This is fairly common if you have a direct sales type setup. The salespeople in order to get the end of year numbers, perhaps bonus, will make deals that are too good for the customer to pass up, basically they are giving away the store and will pay for it later. Percentages have their place and they are fairly easy to understand, but they do fall short when it comes to getting quantifiable numbers; however it does provide a qualitative chart that most people can understand. Most of the time, getting people to understand that numbers are being tracked and you’re shifting to a more analytical mindset will yield positive results. Good team members will always look for ways to provide for a more concrete measure of success; it’s a natural tendency. On the other side of the coin, it provides a more quantifiable way measuring progress and improvement in weaker team members. 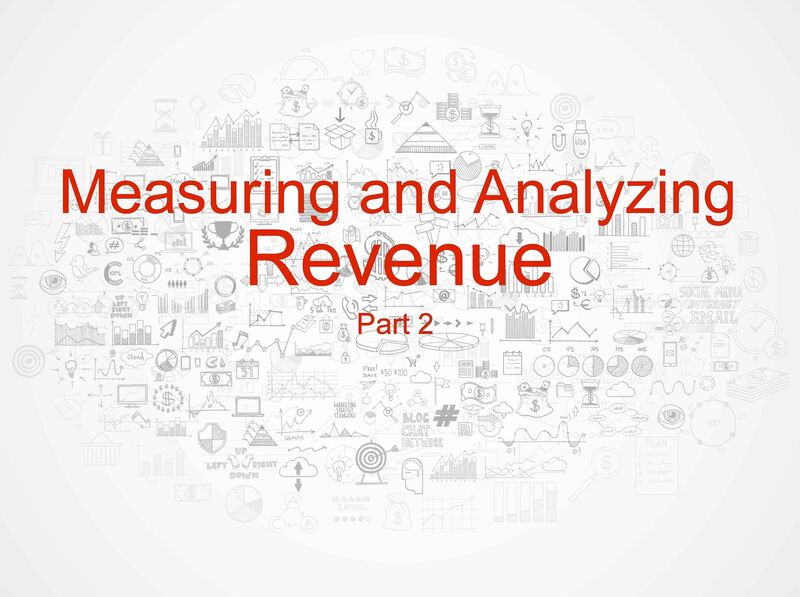 Next in our series of measure and analyze the revenue stream we will introduce the three-month running average and show how that tells a slightly different story when analyzing the revenue along with the benefits and pitfalls of that method.